Across the country, the rural property market is gradually climbing, with both the volume and value of sales edging up. Activity in the autumn market built towards a vibrant season’s end. In some parts of the country, stocks of farms for sale were exhausted. Large farming entities and corporates are starting to emerge again, playing a part in increased market activity. With unsatisfied buyers still motivated and looking for suitable property, signs are encouraging for a positive spring. However, value is top of mind for most prospective purchasers. Reviewing sales in various regions, the market in Otago and Southland is gradually building. During the autumn, finishing units throughout Otago have been in demand, while Southland dairy farms are selling again at solid prices. In both regions, neighbours are active, buying adjoining properties or farms nearby. long-term approach to developing international markets for value-added produce that has been applied in their sectors over a sustained period. Sheep and beef property is in demand throughout most regions. Meat company schedules and export projections for sheep and beef farmers are sound, while excellent autumn growing conditions throughout most of the country have provided a surfeit of pasture that farmers look set to capitalise on. pay-out, optimism has also returned to the market for dairy property. While this is not a dramatic headline-grabbing leap forward, farmer confidence is edging back compared to the ‘sit tight’ attitude that prevailed before the global dairy trade auction started to rise. 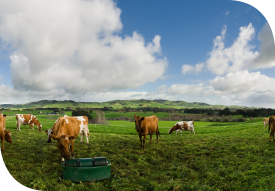 While many dairy farmers are thinking about buying land again, and some prestigious listings will come to the market in late winter and early spring, a big focus within the sector remains on price. Although market signals are encouraging, returns and affordability continue to be the critical factors in any purchase decision. Funding availability will be an important component for most transactions as we move into spring. A buyer’s equity and the demonstrable cashflow from a property will have to stack up to persuade financiers to underwrite most purchases. Despite the generally positive market indicators, and quantified demand from motivated potential purchasers, listings of rural property are in short supply. Even farms that had been on the market for an extended period found willing buyers during the autumn. Unsatisfied purchasers, with financial resources, are still out there looking for rural property, with relatively little to choose from. From across our nationwide network, we know that a significant number of farmers plan to list property for sale. Most are likely to withhold from going to the market until the spring. While that is understandable in some respects, it may not be well advised. Farmers may be better off going to the market now, with less competition and more buyers to present to. Although spring is traditionally a good time to sell, with farms looking their best, those who wait that long are going to face increased competitive pressure from other vendors. They will also encounter prospective buyers who have access to more choice, and who will therefore place greater focus on value. Consistently, from regions throughout the country, and across most primary production sectors, there is a renewed emphasis on quality. Purchasers demand proof that any property they buy will pay its way. They will need to establish a business proposition before taking on a farm, and any documentation provided by the property’s previous owner will need to support that. In short, steady demand prevails for quality rural property, although listings to meet that demand are insufficient. Anyone thinking about marketing property should therefore act sooner rather than later, initially by taking independent professional advice. That should include contacting PGG Wrightson Real Estate’s nationwide team of rural property specialists. We look forward to your call.